UPDATE 3/19/19: the rifle range will be closed until mid afternoon on Wednesday 3/20/19. If you go to the range in the afternoon please make sure all work at 200 yards is done prior to setting up. UPDATE 3/15/19: The rifle range is reopen pending new work dates, Check back for future updates. UPDATE 3/13/19: Winter weather conditions have slowed work on the rifle range upgrade. The Chief Range Officer is extending the weekday range closure thru at least 3/15/19. The pistol range is open during this process and the rifle range will be open on the weekend, Check back for future updates. UPDATE 2/25/2019: The Rifle Range will be closed weekdays for repair from 02/25/19 to 03/13/19. The pistol range is unaffected. The range will be open on weekends during this time. UPDATE 2/4/2019: The chief range officer, Franco Scarpino would like to make you aware that the 200 yard "pit" project will be starting soon. During weekdays it will be necessary to close the rifle range. The range will be open weekends. Please check for Email announcements, the club announcement page, Facebook page, and the project page for all information concerning the closures. At the board meeting of November 29th, 2018, the Board of Directors approved the request of Chief Range Officer Franco Scarpino for $15,000 to implement repairs and expansion of the 200 yard rifle pits. This request was also approved by the membership at the regular meeting of November 5th, 2018. Due to the winter season and it’s effect on the availability of required materials the work will most likely start in the spring of 2019. 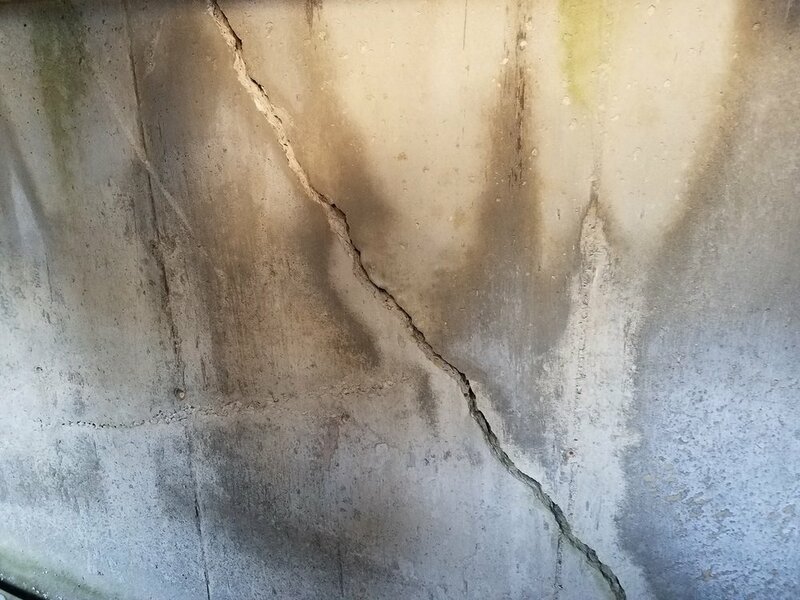 The reason for this request and subsequent approval was the existing structure has become structurally deficient with large foundation cracks and a severe inward lean on the main wall. For those of you unfamiliar with the pits, this is a partially buried concrete structure behind the 200 yard berm used in the handling and scoring of military style sash targets with individuals downrange in the structure during certain rifle matches. 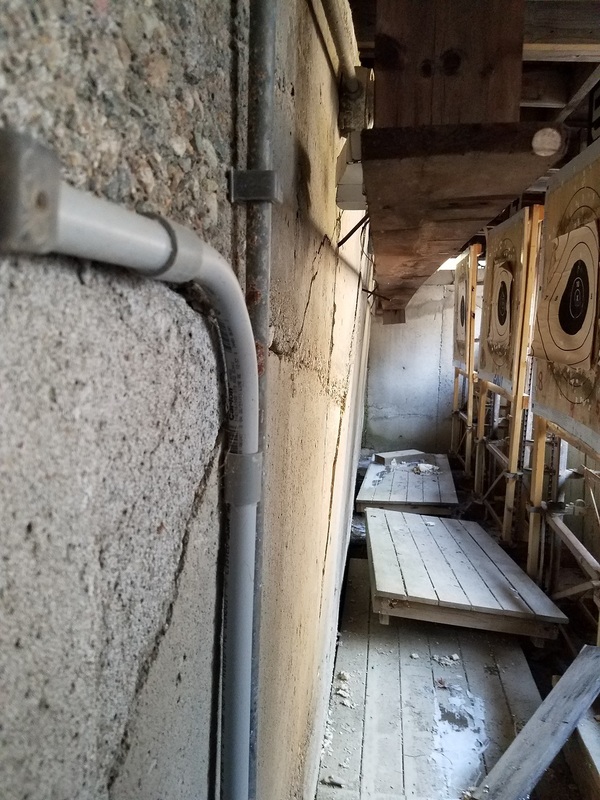 Below are photos showing the existing structure and the problems. Remove the current four position structure. Excavate to expand the length to eight positions. New 6” slab with drainage. A new structure composed of interlocking cement blocks 2'x2'x6' in size weighing ~1.5 ton ea. Berms around the pits will be regraded. This is the 200 yard berm. The “Pit” is located behind the berm under the arrow. The sash targets are raised and lowered through the hatches on the pit roof. You can see the targets from this view. A view of structural damage. Another view of structural damage. Here you can see the wall has started to lean in. Work started on 2/25/19 with the removal of the original structure. Here, they are beginning to lay the new concrete block. Due to the weight and interlocking features, these blocks should be resistant to the effects of the earth back fill. The V shaped protrusions on the top and side fit into groves on the bottom and opposite side locking the blocks together without the need for mortar. Each block is 2’H x 2’W x 6’L and weigh about 1.5 ton.